Well, my blog has been a busy place this last week, huh? (I know, I know, ya'll are saying, "it's about time"! I hear ya! I'm trying to be a better blogger, plus I miss YA'LL too when I don't get to hang out online with you!) I don't see an end in sight just yet--lucky for you! Today is RELEASE DAY from YOUR NEXT STAMP, and we've got an inspiring Blog Hop lined up for ya'll to peruse. 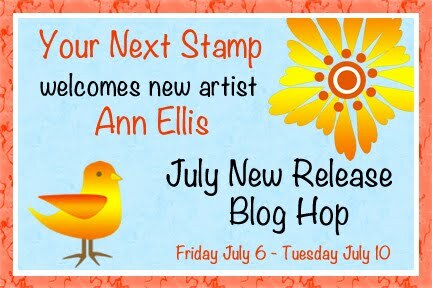 We are so excited about our hop this month, because we are introducing a new artist to the YNS family-Ann Ellis! We just know you are going to love her fun, contemporary style! We also have a few new Ellie stamps and a new Fhiona too! Plus some fabulous new dies that coordinate with some existing YNS stamps – Window Play and a selection of dies that go with the popular Mini Fhiona stamps! WOW, right? All the new stamps and dies are available to purchase today in the YNS Store! To start at the beginning, hop on over to VERONICA'S amazing blog! Ok, on to my card--I used the new Sunflower stamp set from our new artist, Ann Ellis. I couldn't wait to stamp the flowers, cut them out and layer them all up. The great thing about this new set is that it comes with lots of variations for the leaves, centers and stem. It even includes a cut little watering can! My 11 year old daughter, Lindsie stood over my shoulder while I made this card and directed my "creative flow". I followed all of her suggestions (except she didn't like the brown paper, but I did) so she basically designed this card, and I really like the end result. She's going to be my "partner in crafting crime" when she gets a little older, I just know it! 1. The hop will run from today, July 6th at 6AM until Tuesday, July 10th at 11:59PM EST. 2. We have 4 special prizes hidden amongst the blogs, so make sure you leave comments for your chance to win!!! 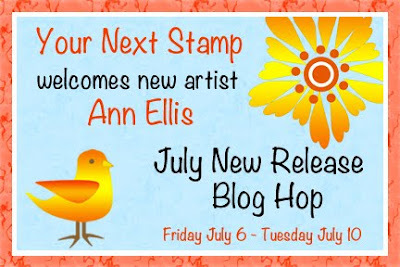 Each winner will receive one of the new Ann Ellis Stamp Sets! 3. Karen is also offering some awesome hop specials and bundles in the YNS Store, so make sure you check those out! 4. We also want to remind you about your new forum on Splitcoaststampers! You can also find us on Facebook and Pinterest. 5. Did you know that YNS Challenges are back? You can find a new challenge every Thursday on the YNS Blog and on our SCS Forum. So MUCH YNS FUN!! SUSIE Q-TIP: Use twine to tie bows through buttons. Then for a different look, attach the button with the bow on the underneath side. Love all the layers on the flower and the button and embossing! Love all the purple. We don't have enough purple in this crafty world. :) Beautiful card. I love the brown with the purple. Good color combo! Sometimes mothers know best. He, he. Pretty card. Susan your card is beautiful! I am in love with the color combo you used! Well you and your DD are a great team!! Wow beautiful colors! Love this so much!! Beautiful card! Love all the layers and the colors are my fav!!! Lindsie definitely got your crafty genes! Gorgeous! Love the flower and the layering! Beautiful card. The sunflower stamp is great with all the layers. Beautiful card. I love the colours and the layout. Thanks for the inspiration. Very pretty colors and love the flower. Simply gorgeous! I really love the colour combo you used. Fabulous card. Love the colors and the details. Thanks for sharing. Love this card - especially the colour combo. Can't wait to see what else Lindsie has up her sleeve. She did a great job helping you to create the card.